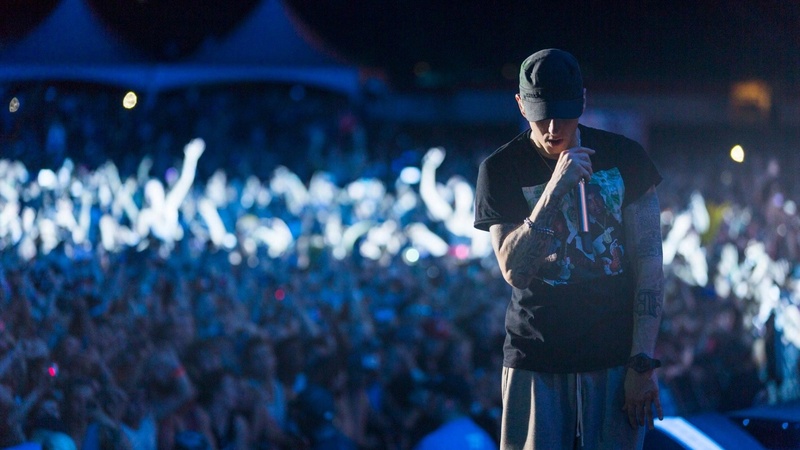 5 Eminem tracks that will motivate you to the core | Wotpost. If you are here, then you are for any of the 2 reasons. Either you like listening to Eminem or you are looking for some motivation in life. Marshall Bruce Mathers III a.k.a. Eminem a.k.a. The real slim shady. With 10 number-one albums on the Billboard 200, his music still stands tall and gathers hooting whenever someone make an attempt to rap like him. Eminem popularly spelled as EMINƎM, is an inspiration for so many. Since in all of his songs, you would find something inspiring, something motivating, I am sharing 5 of his best work which is full of motivation and will give you the chills down till your spine. If you plan to hit the gym, got a heartbreak, depressed or any other awful reason because of which you are feeling down in life, these songs will surely buck you up and will help you move on in life with pride. This song is from his album recovery which was released in 2010. The song is more about how he was almost about to give up on life because of drug problems, but in spite of doing that he took the courage and rose to a better life by quitting drugs. There are some really great verses in the song which are powerful and thought provoking. And all those who look down on me I’m tearing down your balcony. This song won ‘Best male video’, ‘Best hip hop video’ at Mtv video music awards. Also won ‘Best rap solo performance award’ at Grammy’s. As the title suggests, this song is really beautiful. Eminem is describing in this song how life can be unfair. When you are least expecting something to happen, bad things happen at that time. And during that time, how you feel that you are done and cannot succeed. But even at that time he thinks of not losing the heart as he cannot wallow on what has happened, rather move on in life and be the inspiration for others to not give up. This song is from his 6th album ‘Relapse’ which was released in 2009. This was the best song of that album and its video was shot in Detroit. This is the best rap song ever released. Also, the first hip hop/rap song to be honored with an academy award. This song was released in 2002 for movie 8 mile starring Eminem himself. This song has references from his own life and from the movie as well. It is said that Eminem did the entire track in a single take. There is nothing much I can say about this song as it leaves everyone speechless and full of goosebumps. There are very few songs in which Lil Wayne has done some motivating rap. This is an awesome song. The video revolves around bullying in schools and the lyrics are spot on with that. An issue that Eminem himself has went through during his childhood days. The sample of the song is taken from a 90s hit song ‘What is love’ by Haddaway. This song was also from the ‘Recovery’ album. This song while its release was ranking in the top 50 songs in many countries. Its crazy that the official audio or video is not available for this song on YouTube. This is a link to a fan made video. The video is from the movie Real steel. To note, this song was used for the promo of this movie too. This is another great movie. If you haven’t watched it yet, you are missing on something. The song is a great gym track. You can play it and get motivation to do few extra sets of your work out. The song was released in 2002 and was from his fourth studio album ‘The Eminem Show’. The sample music of the song is taken from ‘We will rock you’ song’s famous beats. This song was used in the promo for Call of Duty video game. Also, Floyd Mayweather(Famous boxer) used this song as an entrance theme. Another boxer Shane Carwin also used the same track for his entrance. In NBA, this song was used for the team introduction of Cleveland Cavaliers.